Why do we procrastinate when it comes to doing something we know in the long run will not only be highly beneficial to us, but will also save us from potentially infinite grief? If you have been through the Canadian criminal justice system you have heard it all when it comes to making choices in your life. Add on taking responsibility for your choices, and so on. This is why I hate to say this; procrastination is a choice. 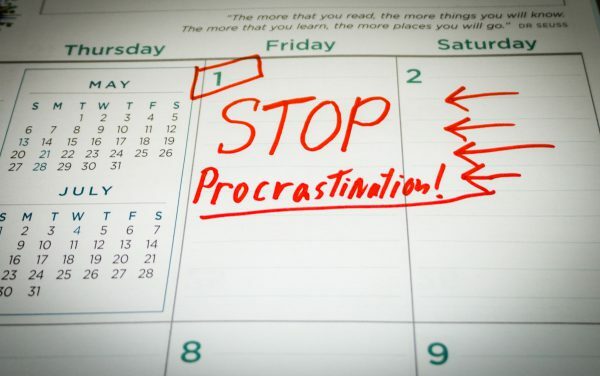 When we procrastinate we are making a choice between working now on a particular task or doing something else we think will either be more fun or less painful. No matter how much we tried to convince ourselves that we NEED to make the call to get a pardon consultation, we manage to find something else that must be done now instead. And so, the call is put off for another day. We will get to it, just not now. What are the long-term benefits of a pardon anyway? A pardon allows us to apply for better jobs knowing we won’t be rejected by a criminal record check. Take the higher wage you would earn and multiply it by the number of years you would expect to work, and the number can easily add up to $100,000 and more. Every year you wait chips away at your total earnings. There are a lot of situations where a criminal record can spoil travel plans. Sooner or later yourself, your significant other, or your family is going to want to travel to the United States for a vacation. Now think about how painful it would be to have to explain why some minor crime from years ago is stopping your vacation plans. Nor would I expect talking to an 8-year-old about why you cannot take them to Disneyland in California would be an easy thing to do. That is not a position any parent or partner ever wants to be in. You can avoid the disappointment by thinking long term and taking action now. In today’s society something as simple as being an assistant coach for your child’s baseball team requires a criminal record check. While getting out of coaching might be awkward, what happens if you start coaching and then you are asked for a criminal record check? There’s no avoiding that situation unless you thought ahead and made the call to get a record suspension ahead of time. A recent CBC news article brought to light that landlords wouldn’t rent to people with criminal records. According to the article the people rejected by landlords were not anywhere close to career criminals. They had never been incarcerated and their convictions were described to be on the light side of the scale. While it’s discriminatory, it has happened and might become more common if not challenged legally. A criminal record tells the world nothing about whether a person is going to be a good employee, a good tenant, or a good volunteer. Having said that, employers rarely take the time to try and understand things they don’t know or care about. As our government currently quotes 6-12 months of processing for a typical application, it’s in your best interest to clear your criminal record as soon as possible to avoid “life” complications. Getting a pardon takes time. The best time to start is now. Contact Pardon Services to get a free, private pardon consultation by calling 204-453-0099. This entry was posted in Pardons, Record Suspensions and tagged benefits, housing, jobs, procrastination, travel. Bookmark the permalink.